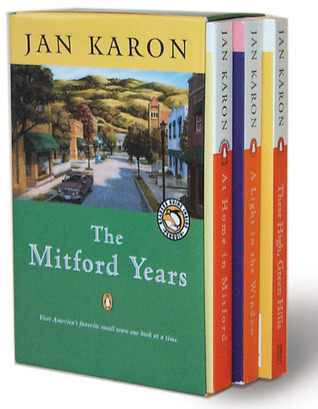 “A good book is like a good friend, one you want to spend time with over and over again.” This is exactly how I feel about The Mitford Series books by Jan Karon. In fact, I’ve spent time with this 9-volume series three different times, and I’m working on the fourth. Most people think I am crazy when I reveal this fact, but it is true. The series centers around a 60-something-year-old Episcopal priest who lives in the quintessential town of Mitford. (Think Mayberry but more picturesque and modern.) And just like Mayberry, the books are filled with regular people, each with their own unique personality and idiosyncrasies. With the first chapter, the reader pictures the town in all it’s southern beauty and grows to love its inhabitants almost immediately. Father Tim is intelligent and humble, redeemed and damaged, loving but flawed. His lifelong bachelor status provides multiple opportunities to both laugh and cry as he deals with an over-involved but well-meaning congregation, an intoxicatingly beautiful new neighbor, an orphaned and unrefined boy, and an over-sized and lovable dog. Karon’s writing is a gentle weaving of the magic and mystery of an ordinary life. Characters are common people living a common life but finding the power of God in the most random moments. This is where we live: in the ordinary, struggling to find God in our ever-changing, sometimes shocking, often monotonous days. It is there where real people, like you and me, find God and know Him. It’s the same with the characters in Mitford. Spending time with this “book friend” always reminds me of a cup of hot chocolate topped with the perfect amount of marshmallows coupled with a cozy blanket. Who doesnt want to revisit those moments? It does’t matter how many times I read each one, I still find a place to giggle or shed a tear; for in the midst of each page is the resounding idea that life can be messy, painful, and beautiful all the same time, but most of all that God can always be found in those days. This is a life truth that I will always need to hear, so I read them again and again. Need time with a good friend? Pick up At Home in Mitford and find a bushel of them waiting for you. This entry was posted in Book Reviews and Recommendations, Reading on May 2, 2012 by aliciachall28.